Hi everybody, hit “L” for a better view! Thanks a lot for all your nice and encouraging words as I began to post on Flickr last week. I am really honored and proud to be one of your Flickr friends! Besides I browsed a bit through my friendlist. I am really thankfull for all you people who support me and just being nice. This is such a cool thing. Why do I write this? Because sometimes I have a quick Internet chat with some of you. And this is just to name some exotic countries where I never have been. I am really happy to get to know you a bit and be a part of your life and culture. You cannot imagine how much this inspires me. 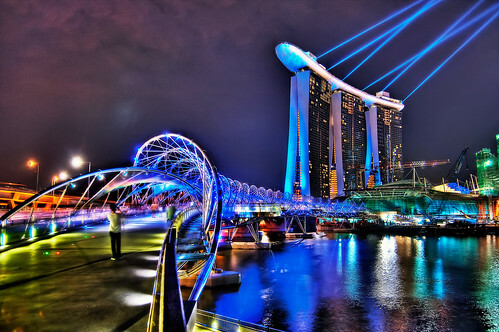 Today is a shot from Singapore. 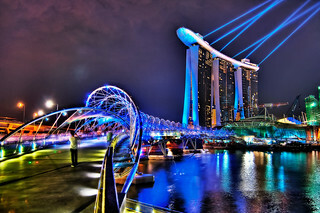 This is Marina Bay and the Helix Bridge. The shot has been taken in 2010. I am sure it looks totally different today! Have a great week all you people.